I claim to be no fashionista. One look at my daily uniform of jeans, a hoodie covering a t-shirt, and skeakers would tell you that. But deep inside me is a girl that adores trends. There lies a girl that scours In Style in the doctors waiting rooms, spent half an hour picking out "Laguna Beach" oversized sunglasses, and watches hem lines like a hawk. Save my '80's revival sparkly ponytail holders, clothing trends don't follow me into the kitchen. (A belted extra long chef's jacket? Corseted in the back?) This doesn't mean, however, that I leave the trend loving girl behind. Trends in cuisine run as deep through our community of cooks as Ugg boots through the crowd at the Bellevue Mall. For every girl carrying a Fendi Baguette bag there is a cook squirting a foam out of thier brand new ISI canister. For every woman who utters "Manolo Blanik" with the hushed whisper of the faithful, there is a cook with "Ferran Adria" resting on their prayerful lips. or as they might say in the O.C., just C.B.S. 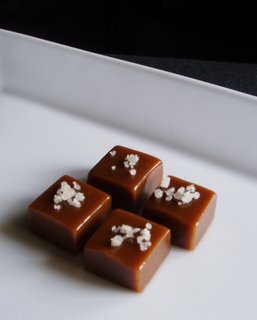 The hottest of Haute Caramels belong to Chocolatier-Camarelier Le Roux in France, who's sweets are said to be, "a panopoly of pleasure," and to who we owe thanks for the ultra hip "C.B.S". Here in seattle, those in the know buy, give, and sing praise of Fran's smoked sea salt caramels. DavidLebovitz even has directions on the proper way to eat these trendy treats! (Salt side down). While at The Fat Duck, a salted caramel was prepared as a component on a dessert, which left a tub for Micheal and I to scrape clean with spoons. A weekly fix that soon became a deep, wanton desire for the sticky, salty, sweet sugar. Being the good little trend lover that I am, I too have a salted caramel on my menu. The recipe is adapted from The Fat Duck, the most significant change being the addition of creme fraiche rather than cream. The addition of creme fraiche adds an acidity that ballances well with the salty, sweet complexity of the caramel. This caramel has earned praise from the staff, guests, and my toughest critic Russell, and received the best compliment a dessert can get; customers requesting seconds! The recipe follows, but is not for the faint of heart. Have ALL your utensils at the ready, resting next to you. Have your pan lined with foil and lightly greased very near you. Have your creme fraiche warm, within a short reach. And if all else fails, be ready to try again. This recipe is given in grams, the most accurate way to measure anything, except for the salt, which I have adjusted to my liking with 2 level tablespoons. The salt I use inside the caramel is Kosher salt. If you are using another salt, sea salt perhaps, you will find the saltiness varies. Sea salt tends not to be as salty at Kosher salt, while table salt is much saltier. 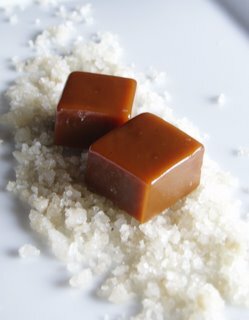 I finish my caramels by sprinkling with the rough crystals of a grey sea salt, although any nice sea salt will do. As a saftey precaution, have a bowl of icewater near you also. Burns from caramel can be some of the worst injuries the kitchen can inflict on us. 1. Put the creme fraiche in a small sauce pan over medium heat, bringing it up to a low simmer, then keeping very warm until needed. Do not boil, simmer, or let any of the creme fraiche reduce in any way, or your caramels will not be soft enough to chew. 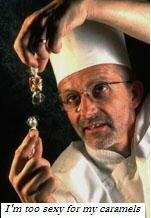 If this happens, re-weigh the creme fraiche, replacing any of the volume that may have evaporated. 2. Combine the sugar, corn syrup, milk, and salt in a bowl. Mix until all the sugar ismoistenedd and the mixture is even. 3. Place the butter in a heavy bottomed sauce pan, and pour the sugar mixture over. Cook this over high heat. Stir occasionally, with the wooden spoon, until the mixture reaches 230 degreesFahrenheitt. At this point it will begin to take on color and need constant attention and stirring to ensure the caramel doesn't scorch. 4. Continue stirring, making sure the wooden spoon is scraping the pans surface everywhere, especially behind the candy thermometer, if your attaches to the side. I move the thermometer to a new side of the pan every 30 seconds or so, as needed to avoid any scorching. If you feel the caramel is scorching despite yourdiligentt stirring efforts, turn the heat down a little. 5. When the caramel is at 300 degrees Fahrenheitt exactly, remove the caramel from the heat, pull the candy thermometer from the pan and pour in the very warm creme fraiche. Quickly dress your hand with the oven glove or a towel wrapped around all your fingers and your hand up to the wrist, and secured in your palm. With the wooden spoon, begin to stir the creme fraiche into the molten caramel. Stir slowly at first, making sure none of the creme fraiche bubbling on the surface splashes out. Continue to stir more aggressively as the creme fraiche mixes in, returning to the heat if needed, until the mixture is perfectly emulsified, and not a lump remains. 6. Pour the caramel into the prepared pan, using the heat proof spatula to scrape the contents from the pan. Let rest on the counter for 3 to 4 hours, until the caramel sets firm. Unmold and cut into desired pieces. 7. For ease in cutting the caramels, refrigerate for about half an hour. It will become firm and cut into nice sharp edges. light or dark corn syrup? I think it's great that you are putting the hard recipes here. Have you tested this recipe in a home kitchen? I hate to be a bother but I do think it's important to say that a big bowl of ice water should be near by in case the caramel lands on you. It is the most dangerous of all the liquids in the kitchen, professional or otherwise. In the middle of service at Gramercy Tavern a tarte Tatin got nasty and landed a blob of caramel on my arm. Hair still does not grow there and I could not sleep for days from the pain. Shuna- You are right, a bowl of icewater will be added to the list of things to have at the ready. Caramel burns are NASTY. Thanks for the recipe! Will definitely look forward to this. What is the active preparation time? Thank you! The salt you put on top- do you need to sprinkle with the caramel still warm to get it to stick? Or would it meld into the caramel? I'm a huge fan of the Fran's ones but these sound even better with the creme fraiche. Annon- the active prep time... let me think. From the time you put the sugar and butter mixture on the fire, it takes about 5 minutes before you have to stir. Then, when stirring, it takes up to 10 minutes. These are rough estimates. Kat- I hadn't thought about that. I actually use a blow torch to gloss the surface of the caramel for plate presentation, and then sprinkle with salt. So if you have a creme brulee torch, bring it out. Other than that, you will have to play with getting the salt to stick, I don't have the answer. could you use one of those flexible silicone baking pans instead of buttered foil, or is there a fatal flaw in that plan? Seth- The buttered foil is lining a mold with tall sides that keeps the molten caramel in shape while it cools. The caramel could sneak under a mat if it were lining a mold, which would still need buttered foil on the sides to prevent sticking and ease in removal. The Silicone mat would release from the caramel, you are correct in thinking that. But as far as lining the mold holding the caramel, buttered foil is your best bet. Trendy or not, I still can't resist the combo of sweet and salty flavors. I can't wait to try this recipe, thanks for posting it. mmmmm...trendy or not, they sound marvelous....but daunting, even without worrying about caramel burns! I love reading about the technique. I've been following food blogs for ThisNext.com and have really enjoyed your posts (lavender lemon pound cake, for example, which is less intimidating!). Looking forward to more. Thank you for the recipe! I tried it last Sunday morning and it turned out wonderfully. I asked about the active preparation time earlier. It actually took close to 45 minutes because the mixture had to reach 300 degrees. Before completely chilled, the caramels seemed a bit rich. However, after fully solidifying, (although they didn't look as wonderful as yours), they had an extraordinary taste. How do you cut yours so beautifully? Do you have a special trick? Thanks again for the recipe! Last question - if you were stranded on a desert island where you had all the kitchen supplies and premium ingredients you'd ever need (and more), what 3 savory cookbooks would you take with you? Dessert/pastry books? Cheers! Annon- I am glad your caramels turned out! My trick for cutting them is to refrigerate the caramel for half an hour, until it is stiff. Then I cut it while cold to make sharp lines. Laurels Kitchen because I was raised on it.